Back in July (scroll right and down to navigate to these posts), I wrote a series of posts about my kit for mountain-top bivvies, and how I was changing this to try and reduce my pack weight, hopefully leaving me more energy for photography! The major changes I made then (down sleeping bag, ultra light bivi bag and close-fitting Optech neoprene pouches for camera protection) meant that not only did my pack weight reduce significantly, but so did the volume. This got me thinking about a smaller, lighter rucksack. 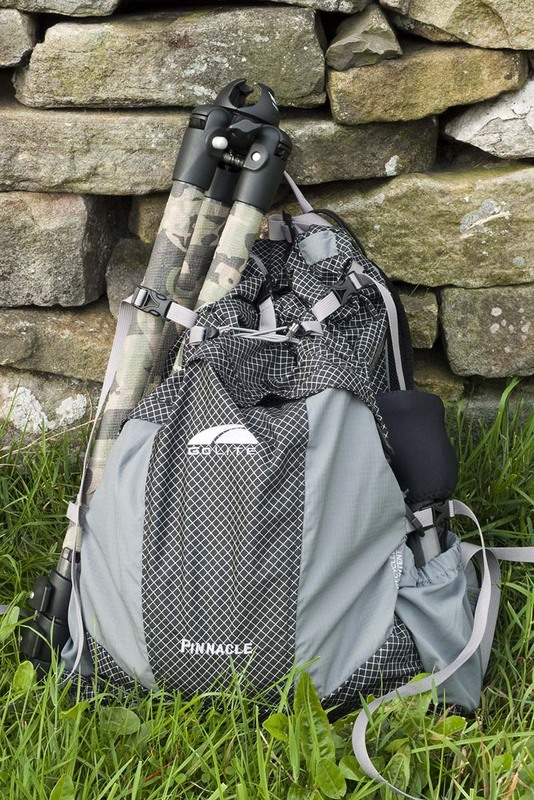 After a bit of internet research and reading a quick review in Trail magazine, I duly mail ordered aGolite Pinnacle rucksack, taking a bit of a risk as I was unable to find a local dealer to try one out. Amazingly, the Golite pack is 2 kilos (4.5lbs) lighter than my 90 litre Berghaus C7, yet still offers a 72 litre capacity and takes a 3 litre hydration bladder. This looks good on paper, but I was concerned on 2 counts: durability and comfort. I find the Berghaus's Bioflex back system to beextremely comfortable, even when carrying heavy loads, but only use in the field would tell how the Golite compared. 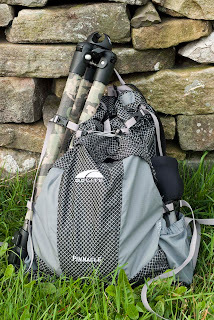 As regards durability, I read plenty of reviews commenting on how tough the lightweight fabric is, plus I would be loading up with only around half the 18 kilo maximum payload specified by Golite. The fact that the Golite lacks a waterproof cover didn't both me either as, I always line my pack with waterproof liners (rubble sacks!). Even so, to keep the pack as dry as possible when exposed to the elements all night on my wild camps, I also bought a Sea-to-Summit waterproof cover (well worth the extra 100 grams), which coincidently came in almost exactly the same colour as the pack. When my new rucksack arrived, I didn't even recognise it from the package - it packs down really small when empty! Unpacked, first impressions are good, obviously it is very light :-), but the materials feel robust and the construction is of good quality: it feels like it would take a bit of abuse. The hydration bladder pocket has a hook to hold the bladder upright, and there is a hole each side to feed the drinking tube through, so it can come over either shoulder, a nice touch. To save weight, you do loose out on pockets and compartments, as this is basically one big sack. For example, there is no lid, where you would normally find a couple of pockets. There is one large pocket on the back, which I quite like as it's opens wide so it should be easy to find things in there. Outside, you get conventional walking/ski pole pockets on each side, which is important as I use these to stash my tripod, legs on one side, column and head on the other, cinched in by the compression straps. There are also two small pockets on the hip belt - first impressions are they will be very handy for storing snacks, keys, torch etc. - you might even fit a small compact camera or GPS in there. The pack also has some elastic straps which in combination with the compression straps means it can be used as a daypack of around 25 litres. So far so good, loaded up with gear, I would say it is 'comfortable enough'. What I mean is, I wouldn't want to hike all day with it, but for a couple of hours each way up and down, it is more than good enough, and the slight lack of comfort (compared to my Berghaus) under these conditions is made up for by a bit more spring in my step!